Embroidered snowflakes (We used the snowflakes from Annthegrans Fancy Snowflake collection. We sewed them on wash away mesh stabilizer. Badgemaster would work as well. Then we cut away most of the stabilizer and used a spray bottle of warm water to spray away the edges and holes, leaving much of the stabilizer in to keep the snowflakes stiff. We placed them on a plastic table cloth with old books on top to be sure they dried flat. And we strung popcorn for her tree at home while they were sewing. 1. 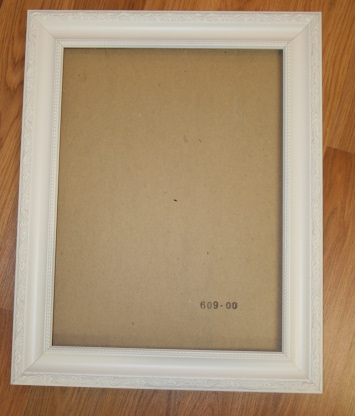 Take the cardboard frame backing and use it as a guide to cut your fabric. We cut ours slightly larger all the way around. 2. Starch and press the fabric. 3. Cover the cardboard square with Mod Podge and adhere the fabric rectangle face up onto the cardboard smoothing from the center out. Let dry. 4. 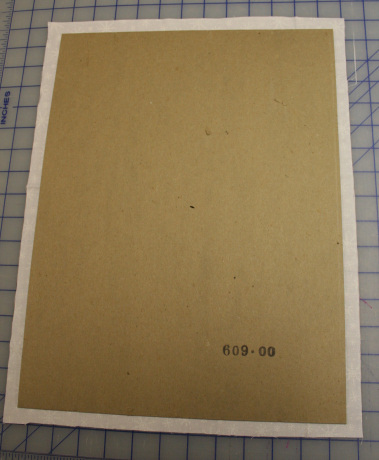 Recut the fabric so that it is flush with the cardboard edges. 5. Trim and glue the song sheets on top of the fabric. Set aside and let dry. 6. 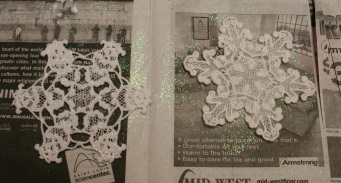 Lightly dab Mod Podge on top of the embroidered snowflakes and sprinkle with glitter. Set aside and let dry. 7. 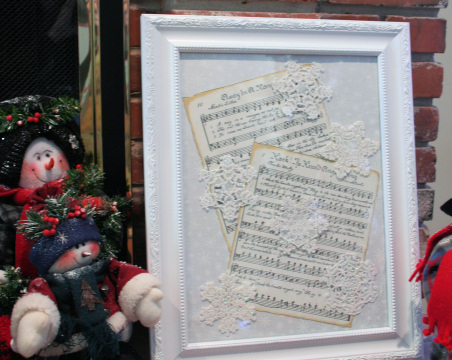 Glue snowflakes on top of the song sheets. 8. Place back in frame and secure. Now you have a great addition to your Holiday decorations or a unique gift for someone who has everything. 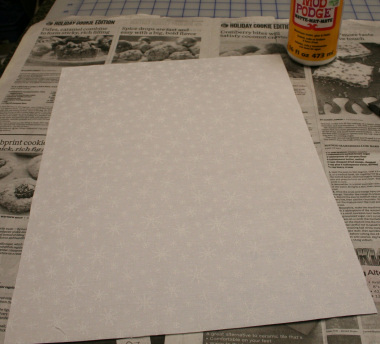 Here is another blog with free freestanding snowflakes and a few more ideas. The girls have made lots of gifts this year already. They have made these snack bags in camouflage for daddy (he had been using the girly ones in his lunch. One made one of these pillowcases for youngest sister (hers is Tinkerbell themed. Those have been wrapped and taken home already. Yesterday the oldest made this simple car air freshener, a magic wand and some felt salt and pepper shakers as gifts for her family. She also made a nursing cover. The weather warmed a little and we finally got to go out and build a snowman before it all melted. 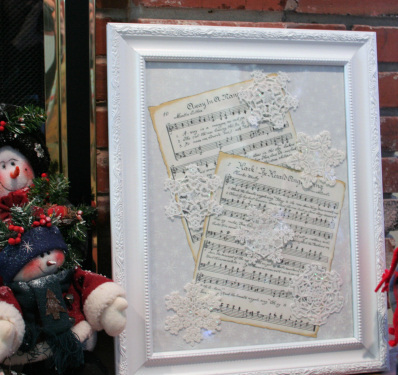 Hope you have had a great time this winter making holiday gifts with your embroidery machine. I LOVE this classy project! What a simple yet terrific project!